Click here to read in full what the Metro Times had to say about Sting's concert at the Fox Theatre. Were you there? Share your review or comments and post any photos from the evening or your ticket stub to the event page. Tell us about it! ''In celebration of the 25th anniversary of his solo career, Sting hit the road performing and selling out dates throughout North America. With him on stage was, Dominic Miller, Dominic’s son Rufus, Vinnie Colaiuta on drums, Peter Tickell on electric fiddle and Jo Lawry on backing vocals and fiddle...'' Click here to read in full what the Chicago Music Guide had to say about Sting's concert at the Rosemont Theatre. Were you there? Share your review or comments and post any photos from the evening or your ticket stub to the event page. Tell us about it! ''There were no former bandmates from back in the day. No symphony orchestras. No theatrics. No distractions. It was Sting distilled. Playing a one-night show at the Rosemont Theatre Saturday, this was the Sting, pure and simple. 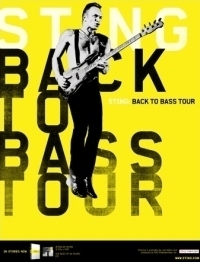 Dressed in a plain gray T-shirt and jeans with a single spotlight on him, Sting was back to basics, or rather "Back to Bass" in a tour designed to celebrate his 25 years as a solo artist. He started the night with 'All This Time', accompanied by a five-piece band, including father and son guitarists Dominic and Rufus Miller and fiddler extraordinaire Peter Tickell, as well as drummer Vinnie Colaiuta and vocalist Jo Lawry.'' Click here to read in full what the Chicago Daily Herald had to say about Sting's concert at the Rosemont Theatre. Were you there? Share your review or comments and post any photos from the evening or your ticket stub to the event page. Tell us about it!